The unique 2-piece design makes Vena iSlide easy to install and remove. Just slide off the bottom piece to connect your iPhone SE/5s/5 to charging or multimedia dock while leaving the top piece intact. Vena iSlide is made out of polycarbonate (PC) with soft and smooth rubber coated exterior to provide exceptional grip to your iPhone SE/5s/5 while protecting it from dust, dings, and dents from everyday use. 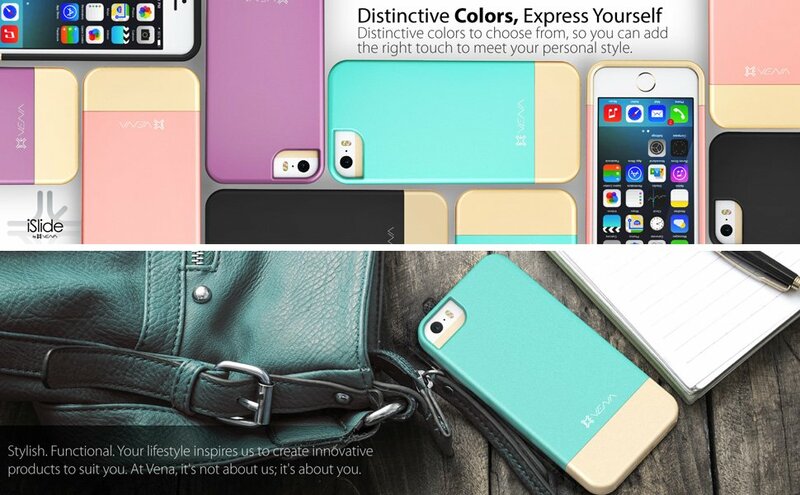 With the soft microfiber interior, Vena iSlide not only provides soft cushioning to your iPhone SE/5s/5, it also makes installing and removing the case a breeze. The slim and stylish profile protects your phone with minimal bulk and complements the essential look of your iPhone SE/5s/5. Vena iSlide is reinforced with precision cut-outs to suit the iPhone SE/5s/5 and provides effortless access to all ports, buttons, and features. What she wanted Review by D. H.
Birthday present for granddaughter, loved it! The case fits snuggly around my phone and it's easy to get off and on. The colors are amazing and the case feels super durable. I would highly recommend, especially for the price. Love the feel and look of the case, this is my second one and I highly recommend it!